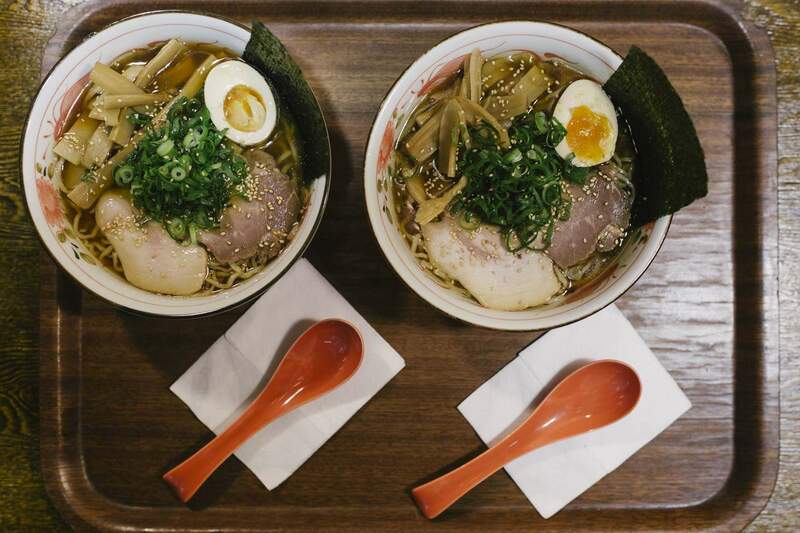 There's a particular noise that you should hear at any good ramen place — and you'll hear it in abundance at Taro's Ramen. Even those trying not to slurp their noodle-filled broth just can't help it, because that's what eating the delicious dish is all about. At their new 480 Queen Street base, and their third venue after their existing Edward Street express eatery and Ascot outlet, Taro's is alive with the tell-tale acoustic signs of people enjoying their Japanese soups. And with their famous Tonkotsu ramen on the menu, that's understandable. It takes two days to make, which is why its stock is so super rich — and it comes in standard, fire (with four types of chilli) and red (with a mild homemade chilli sauce) varieties. Apart from their beloved take on the titular dish, there's plenty of other reasons to visit their fresh digs in one of the city's newest buildings: shiny decor; an array of salads, grilled meats and gyoza; the wonder that is green tea ice cream; specials like Jiro ramen (which Taro's calls "Japanese bogan food"); and shoyu, shio and miso-based ramens as well. That's a hefty list, so you know you won't leave here hungry. You will leave with the sounds of slurping echoing throughout your head though, of course.